Do you like bleached blonde hair wigs? Who doesn’t love that 613 hair color look? Our Russian Blonde 623 hair color is our latest introduction to the market and has been a popular buy! For those who love exotic colors, 613 full lace wig is perfect for you. Blonde hair has always been popular, but recently the Russian Blonde hair extension trend has been on the rise. 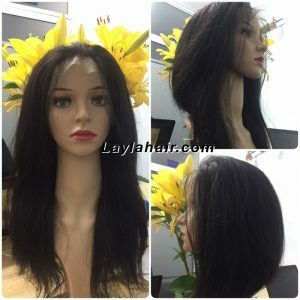 For the reasons above, let’s explore with Layla Hair Company about 613 human hair lace wig which is quite popular and make your appearance so fabulous. What is 613 full lace wig look like? Let’s start with the definition of 613 hair color. As you know, 613 hair color have other name is Russian blonde which is one of the most beautiful colors. It is our next shade lighter from a dirty blonde. This is a bright blonde shade with warm, golden undertones. If you were to go to the hair salon and have your hair bleached, this is likely the color that would result. With celebrities like Nicki Minaj rocking #613 hair color bundles down to her ankles. It is no wonder why so many women have been following suit. Besides, Layla Hair available 1b/613 full lace wig, 4/613 full lace wig, and 613 lace front wig. 1b/ 613 full lace wig has ombre color. It means blonde lace front wig with dark roots. A darker top and lighter bottom will add sheen and shine to your hair that will leave you feeling gorgeous. Dark roots, blonde hair? Why not! Dark roots used to be a blonde’s worst nightmare. But in recent years a dark, smudgy root has become a blonde hair color trend. The flattering look relies on proper root blending and hair toning, which should always be left up to your professional stylist. In addition, the looks are super low maintenance since your natural hair color grows in nicely. Without any harsh lines. If you’re thinking about going blonde (or blonder), take a look blonde with dark roots- 1b/613 full lace wig. Moreover, 4/613 full lace wig is the latest trend. 4/613 color is piano mixing color, it can be perfectly matched with your own hair – giving you longer hair, low lights, highlights, or added volume. Our range of hair extensions in Medium Brown and Bleach Blonde mix (No. 4 and No. 613). 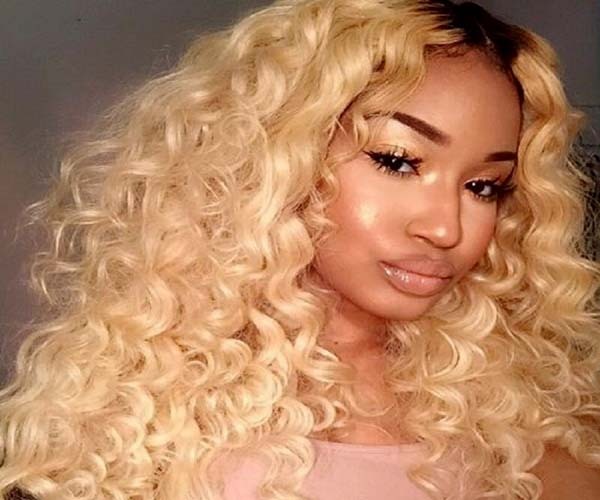 With a highlighted look, our Medium Blonde/Bleached Blonde mixed all natural human hair extensions can instantly give you longer hair, thicker hair or a whole new style. 613 lace wig in Layla made by 100% Remy Hair. It is Vietnamese and Cambodian sourced and is the softest, finest, and among the most versatile virgin hair. The 613 blonde wig is fine and medium in density, so it sits and moves lightly.. It is called machine weft hair. Our weft is double weft so it is very strong, not fall out and you can easily use it without worrying about any problem. Our weave straight hair extensions were only washed with shampoo and clean water. And you do not need to use special condition, just use coconut oil to apply in hair because our hair is 100% natural human Remy hair. Moreover, 613 human lace wig is awesome. It can come to the best hair extension you have. It is healthy and neat with no tangle or no shedding. And, as it is virginly collected from either one donor or more than one human beings. The quality is without doubt hi-end. These hair integrations stay gorgeous without any fears of washing or handling. And, all lace front wig or full lace wig in Layla made by skilled craftsmanship with French lace. One of the advantages of a French lace wig is root in its thickness. It is also durable but sometimes detectable. A French lace is a great choice if you are rough with your lace wig or remove it very frequently such as every other day. 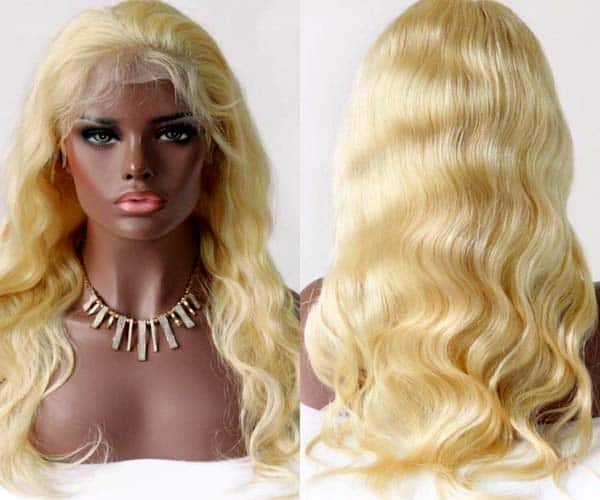 613 lace front wig full handmade with skilled craftsmanship help your appearance is so hot. Let’s change our look and be more beautiful by having 613 full lace wig! So, go to Laylahair.com to get your own fantastic 613 human hair full lace wig weave or any other products in our huge collection. If you want other size or textures, the example of 4/613 or 1b/613 hair extensions or any sizes. We will meet all your requirements. Color: 613 blondes, 1b/613 ombre color, 4/613 mixing piano color.